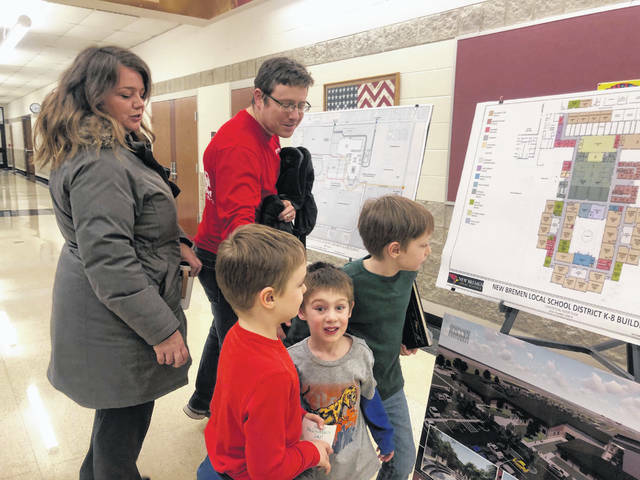 Lisa and Joe McGovern, and their sons Connor age 6, Liam age 4, and Aidan age 8, look at the designs for the new New Bremen Elementary School. Joe McGovern said the kids were excited about going to the new school. New Bremen Local Schools Superintendent Jason Schrader addresses the audience during an update on the new school building Wednesday night. 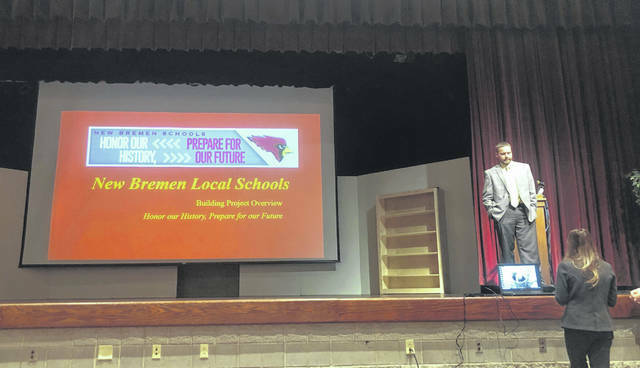 NEW BREMEN – New Bremen residents attended a public meeting Wednesday to hear final plans for the new K-8 building project, which has an estimated cost $17,489,827 when completed. 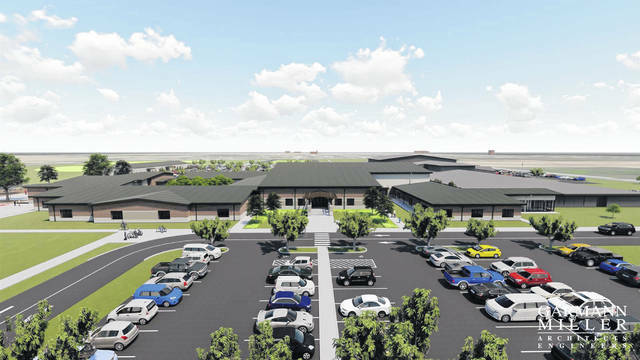 At a brief meeting before the public presentation, the Board of Education approved the Guaranteed Maximum Price (GMP) contract offered by Gilbane Building Company, the general contractor overseeing the project. This allows the New Bremen school district to open the project for bids starting Thursday, Feb. 7. In his public presentation, held in Dicke Auditorium, Superintendent Jason Schrader said groundbreaking is anticipated to happen on March 28, 2019, and that the new building be open by August 2020. Besides the new elementary, the project involves the demolition of the old elementary and paving of the school’s entire parking lot. Schrader pointed out the many innovations in the new building as well as costs savings realized with some of those changes as well as the challenges. He first reviewed what it has taken to get to this point. He said the bid is going out during vary challenging times due to fluctuating material and labor markets. He said the district had a pre-bond cost estimate of $236 per-square-foot in 2016 but that by 2018 had increased to $254. Schrader said these increased estimated costs at first required the original plans be reduced in scope. For example, the seventh- and eighth-grades were moved into a space in the current high school. 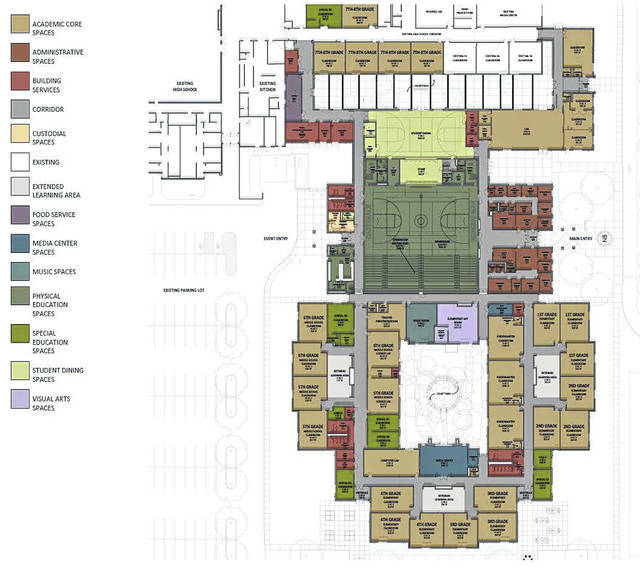 However, the superintendent said the $1 million donation of Dianne Komminsk to build the Center for Innovative Thinking brought the total square footage of the new elementary to 77,000. The center will allow robotics, career exploration and community access at the new facility. Some highlights of the new elementary building, which will be attached to the current high school, includes space for innovative technology, extended learning centers, a conference room and concession space. Security will be enhanced with egress from all doors and windows, as well as a new restroom design that allows better supervision. The building will also have maximum natural lighting, energy efficiency, and sound in all the classrooms. Grades would be divided into pods grouped by grades K-2, 3-4, and 5-6. He emphasized other desired features might be added back in if the construction estimates for the general project are lower than estimated. Those features could include tile on walls rather than drywall, rubber flooring instead of carpet, improvements to the front parking lot and additional signage. Schrader pointed out that using the same high school kitchen area for the elementary is one example of cost savings. He added the retro-fitting of the facility would also allow expansion of the lunch menu to include hot and cold items. Other cost savings were found by emphasizing refining education practices, including more co-teaching. For example, he said, the district will move special education on-site as well as the Education Management Information System. He said other savings were realized by having only principals for K-6 and 7-12 and reduction of staff through attrition. He said these changes totaled $800,000 in annual savings. One visitor asked it was certain the bid would come up at the anticipated cost. Schrader said the GMP contract signed by the general contractor Gilbane Company showed that the company is confident in their estimates since they are willing to cover the cost of overages. Another member of the audience asked about how traffic safety would be maintained. Schrader said that although they cannot get the speed limit on state Route 274 reduced they will extend the school zone out to the limits of the new property boundaries. He also said traffic will be controlled on the school property with the one way traffic pattern on the drive in front of the school complex. Buses will enter the property from Kettler Road at the back of the building. Efforts are also being made to preserve or reuse parts of the old elementary. For example, Schrader said a section of the gym floor with the letters “NB” will be cut out and mounted over the door of the new gym. For the things the school cannot use, there will be a public auction.